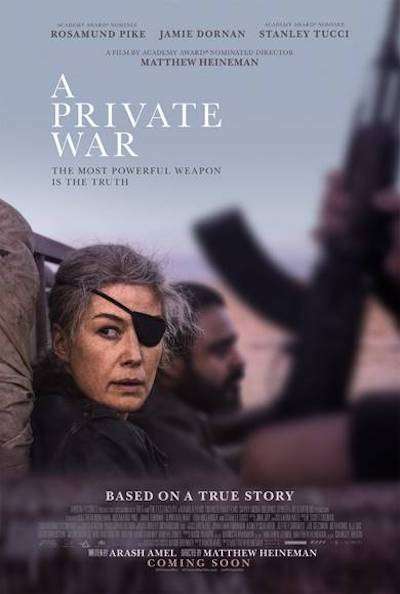 Academy Award nominee Rosamund Pike (Gone Girl), last seen in the fact based drama 7 Days in Entebbe, goes for the nonfiction route once again with A Private War, the story of late war correspondent Marie Colvin. Wearing a black eye patch after being hit by a grenade in Sri Lanka, Colvin was undeterred in capturing war’s inner workings and brutality by being as close to the conflict as possible. Renowned photographer Paul Conroy (50 Shades of Grey’s Jamie Dornan) was by her side during Colvin’s last assignment in the Syrian city of Homs. Though certain dramas of this genre may come off as heavy handed and overly manipulative, A Private War may be above that fray. Matthew Heineman, the filmmaker behind the acclaimed documentaries City of Ghosts and Cartel Land, directed the feature. Check out the trailer and tell us what you think! A Private War, co-starring Stanley Tucci, opens in New York and Los Angeles on November 2nd (with a wider release on November 16).